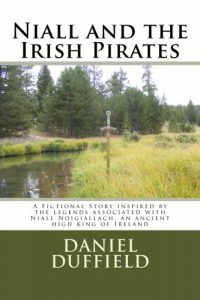 “Niall and the Irish Pirates” is the first in a trilogy about Niall of the Nine Hostages and his descendants. It is an Irish historical fiction book inspired by the legends associated with Niall, an ancient high king of Ireland (Photo by L.M. Hoskins). By the year 355 CE, the Roman Empire had expanded westward first conquering Gaul (France) and then Briton. The Romans then ventured northward in an attempt to conquer Alba (Scotland) before continuing westward to conquer the adjacent emerald isle called Eriu (Ireland). Torna knew from the moment he found the abandoned newborn baby in the deep forests that he was being protected and guided by the forest spirits for some great task. Would the baby become savior for the people of Eriu and stop the Roman Empire from their ever-expanding reign of tyranny? Torna only knew that he and his wife were to do their part and raise the child as their own and they named him Niall. Niall’s path was up to the spirits of the oak trees who were involved in the destiny of all. Kindle ebooks downloads for $ 2.99 or paperbacks for $ 9.99.